The New Horizons Spacecraft is the first step of NASA's $650 million New Frontiers program. It's about the size of a grand piano and is powered by a small nuclear engine. Fun fact: New Horizons notched the highest launch speed in NASA's history when it lifted off in 2006 aboard an Atlas V rocket from Cap Canaveral. Shot directly into a solar escape trajectory, New Horizons sped towards Pluto at more than 37,000 mph—just a hair slower than Voyager 1, which exited our solar system traveling at 38,350 mph. The spacecraft's mission is a simple one: Discover how Pluto and its oversized moon, Charon, came to exist as a binary planet, and also what Pluto's surface and atmospheric compositions really are. The dwarf planet is so ludicrously far away from the Sun, we've never really studied it up close, and that's exactly what New Horizons is built to do. 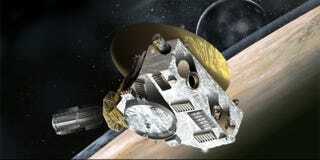 In July of next year, the spacecraft should reach its nearest flyby point of Pluto, upon which a suite of on-board long range imaging and sensing instruments will go to work. Though, at 37,000 mph, they'll have to work fast. Once New Horizons is done with Pluto—and assuming it's still functional after all that time in interplanetary space—New Horizons will attempt to study objects floating around the Kuiper Belt. You know the Kuiper belt: It's where the asteroid that wiped out the dinosaurs came from.